For many years now my family I have contemplated a summer vacation in Myrtle Beach (www.visitMyrtleBeach.com), dubbed “the jewel of South Carolina.” In early winter, we had a family meeting and decided that the time had come to finally experience a week in the area popularly known as the Grand Strand. I can now enthusiastically share with readers how extraordinary this place is. In fact, there was nowhere near enough time to see everything on our “to do” list. That means a return trip will be necessary. Stretching from Little River to Pawleys Island, and comprising 12 communities along the South Carolina coast, Myrtle Beach is home to world-class golf, 60 miles of sandy beaches, exciting entertainment, family attractions and Southern hospitality. The area welcomes more than 16 million visitors a year. I must give immediate credit to the Myrtle Beach Convention and Visitors Bureau (www.VisitMyrtleBeach.com), which does a fabulous job promoting the area. Follow them on Twitter and Instagram @MyMyrtleBeach and on Facebook at https://www.facebook.com/VisitMyrtleBeachSC. They go the extra mile to attract tourists. My first encounter with them was a few years back when they visited Canada and invited local journalists to come meet with them. Never before have I worked with an outfit like this which was so responsive to my needs and questions. They indeed serve as a model for how all visitors bureaus should operate. 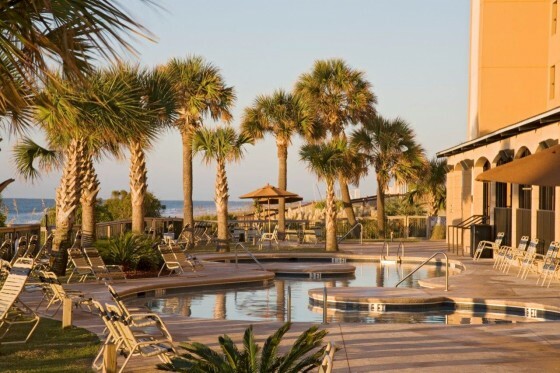 Myrtle Beach has everything you could possibly ask for to have fun year-round, but I must say that sitting by the pool or the ocean on a hot summer day tops my list. There is an endless array of activities to enjoy. WHERE TO STAY: There are approximately 425 hotels and 98,600 accommodation units in the Myrtle Beach area. From elegant golf and seaside resorts, to rustic cottages, bed and breakfasts and mom-and-pop motels, the area offers accommodations for every taste and appeals to every type of traveler. There are also several campgrounds located between Myrtle Beach and the South Strand, many of which are oceanfront or just steps away from the beach. There are also a number of beach homes and condos available for rent, thereby giving vacationing families a true home away from home. We stayed at the Island Vista (www.islandvista.com), a resort locally owned by the Chapman family that has been in the Grand Strand area for decades. The hotel originally on the property was called the Sea Island Inn and was torn down in 2004 and rebuilt as a luxury resort two years later with a wonderful fine dining restaurant called The Cypress Room. Many of the waiters who work at the restaurant have been here for decades, dating back to its previous incarnation. The resort, with 149 rooms, is centrally located in Myrtle Beach, but in a quieter section of the strip and is surrounded by residential homes and no other hotel towers. It has a very homey feel to it. I have never met such a polite staff, from the maintenance man to the front desk personnel. All units are ocean front suite/condo style. We reserved a one bedroom suite with two queen beds in the separate bedroom and a nice pull down Murphy bed, as well as a sleeper sofa, in the living room. The unit also has a full kitchen with dishes and silverware, a washer/dryer, a dining room table, three comfortable chairs, two televisions, an in room safe and an oceanfront balcony. Stephen Chapman, his wife Shelley and his sister Julia Singleton manage the property. They gave me a look at some of the larger suites – two, three and four bedrooms- and let me just say I know what is on my “wish” list for a future trip. Suites range in size from 677 to 2,300 square feet and are highlighted by elegant traditional furnishings such as shuttered headboards, rich draperies and bed coverings, tile flooring, granite counter-tops, plush carpet and floor-to-ceiling windows offering amazing ocean views. Parking is made simple here, with two multi-level lots. We rented a car from Alamo at the airport, which generally has the best deals, and with our GPS and some printed Google map directions we had no trouble finding our way around. The hotel has a fitness and health centre, wireless internet and indoor and outdoor pools. We absolutely loved the pool setup. I felt like I was on a tropical island as our space was just steps from the beach and looking straight ahead at the gorgeous ocean. It is best to get up a little early to secure some chairs and an umbrella. Towels are provided via a special dispenser which recognizes your room card. You can rent chairs and umbrellas right on the beach from the lifeguards. The resort’s swimming complex features an indoor and outdoor pool area with a wide range of water amenities. Unlike any other on the Grand Strand, Island Vista’s indoor pool area reflects a serene Romanesque theme accentuated by a cascading waterfall pouring into a 200 foot lazy river. The indoor area also features a large pool, a Jacuzzi and a kids’ pool featuring pop jets and water games. The indoor facility opens to the outdoors during the summer months and is fully enclosed during the winter. Island Vista’s two outdoor pools overlook the Atlantic Ocean and features pop jets, leaping streams of water and a splash pool. I loved being able to connect to the free Wi-Fi from the pool deck all day. It was quite a novelty and saved me a lot of money on cellular data. Dedicated to preserving the style and grace of the Sea Island Inn, the Island Vista’s elegant design features architecture reminiscent of Howard Mizner and his style crafted in South Florida in the 1930’s. Don’t want to break from your fitness routine while away? The Island Vista has you covered with a nice fitness center which overlooks the indoor heated pool area. It is open from 6 a.m. to 11 a.m. and offers stationary bikes, elliptical machine, treadmills and weight-training equipment. There is an in-house golf director here who is knowledgeable about the many courses to choose from. Special activities for children aged five to 12 take place during Easter Week and from June through August. There are even Kid’s Night Out activities, which provide mom and dad with a break. Each room has a DVD player. When you check-in you are given a card to take out DVDs for free from a special machine in the lobby – yet another plus in terms of customer service. Island Vista’s gourmet restaurant, The Cypress Room, is located off the hotel’s main lobby and features an array of European-infused low country dining selections including signature dishes such as pan seared pork chops with apple and cornbread stuffing, crispy fried oysters with roasted red pepper tartar sauce, bourbon creamed corn and sweet potato hash, and pecan-crusted trout, with herbed butter noissette served over Basmati rice with wild mushroom ragout. Our group shared a crab and lobster timbale appetizer and sampled the risotto with provencal vegetables, roasted asparagus and red onion marmalade with lobster and the fish special of the day, a perfectly grilled Mahi Mahi. We also ordered room service on a few occasions, which enabled us to enjoy longer days at the pool. The Cypress Room also serves a great breakfast daily from 7:30 a.m. to 10 a.m. I thoroughly enjoyed my morning order of two eggs, potatoes, toast, juice and a warm cup of coffee. There is also a full service bar providing alternate seating, as well as a selective range of the finest wines, liqueurs, domestic and international beers and specialty cocktails. There is a large Food Lion Grocery Store just a short drive away. We stocked our fridge immediately with bottled waters and other staples. The hotel has facilities for the disabled and is handicapped accessible. There are ramps at the front and rear entrances and the hotels has purchased its own beach accessible wheelchair. They have a lift to assist the physically handicapped to go in and out of the pool. Some rooms have walk-in showers and benches and chairs to sit on. It is important to share any special requests when making a reservation. For more information about Island Vista, call 800-548-0767 or visit IslandVistaResort.com. DINING OUT: There are approximately 1,700 full-service restaurants in the Myrtle Beach area and it’s no surprise that seafood is one of the primary cuisines. Murrells Inlet is nicknamed“the seafood capital of South Carolina” and Calabash-style restaurants are popular in the Northern Strand, as well as Carolina Coastal Cuisine. Visitors will also find a range of other cuisines to satisfy their appetites, including steak, ribs, barbecue, home-style cooking, international fare and regional specialties. We liked what we heard about Thoroughbreds Chophouse (http://thoroughbredsrestaurant.com) at 9706 N. Kings Hwy, between Magnolia Plaza and The Galleria, in Myrtle Beach’s Restaurant Row and secured a reservation before we left. 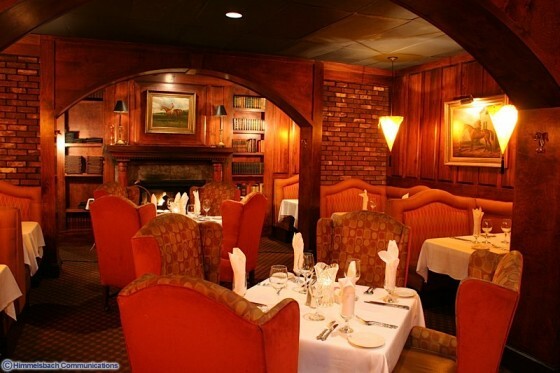 Since opening in 1988, Thoroughbreds has become widely known as one of the locals’ favorite fine dining restaurants after being recognized year-after-year in the categories of most romantic and best fine-dining by the locals. General Manager David Amend and his staff pride themselves in serving only the finest beef and ultra-fresh seafood. The menu’s course options are neatly arranged to fit with the restaurant’s name, beginning with The Starting Gate. It features some salads, escargot, tuna sashimi, shrimp cocktail, colossal crab cake, duck tenderloins, fried calamari, chilled and hot seafood samplers, blackened lollipop lamb chops and sea scallop ramekin (jumbo sea scallops baked with bell peppers and scallions in a crispy golden brown cake). The latter represented the best from of sea scallops I have ever tasted. Next is the Clubhouse turn, French onion soup or prime rib potato and mushroom soup. The Belmont Steaks –filet mignon, different cuts of steak, prime rib or pork chops – are served with a house salad and your choice of mashed potatoes or vegetable du jour. The Chateaubriand Bouquetiere at $76 per couple appears to be the house favorite. A slow-roasted and specially seasoned beef tenderloin, carved and flamed tableside by your server it is accompanied by creamed spinach, sautéed mushrooms, house mashed potatoes and fresh asparagus. Our server was Joshua Amend, the brother of David and quite good at what he does. Caesar salads are prepared tableside by your server and made for two. The full list of sides includes caramelized onions, creamed spinach, burgundy sautéed mushrooms, sautéed asparagus, cold water lobster tail, shrimp scampi, crab cakes or shrimp. Seabiscuit offers the likes of tuna, breaded and baked grouper, salmon provencal, colossal crab cakes and a bouillabaisse (fresh catch, jumbo shrimp, mussels, calamari and crab in a fennel lobster broth). Then there is the Preakness, featuring veal, chicken Dijon, calf’s liver, Cuban congri, Australian rack of lamb, a 12 hour short rib and pan-seared duck breast. I opted for the latter, something not many restaurants offer. It was cooked to perfection and cut like butter. The Home Stretch offers a terrific dessert selection: the triple crown of chocolate, grand marnier crème brûlée, apple spice cake, the Kentucky Derby pie, New York style cheesecake, key lime pie, flaming bananas foster, a wide selection of martinis and other drinks. We shared the Triple Crown and the key lime pie – both excellent choices. I must say that this was a true dining experience and a place I would strongly recommend. As for the history of Thoroughbreds, it is really a story about family and tradition. The original owner of this restaurant was a fan of horse racing. He loved how these animals could be powerful, wild, and unpredictable, yet at the same moment, show grace and elegance. He realized that the mass majority of people will never have the chance to experience The Belmont Stakes, or walk the halls of Churchill Downs. His vision was to combine the aesthetic beauty of these prestigious venues with the allure of Southern charm, cuisine, and hospitality. The Aspen Grille (www. Aspen-grille.com), located at 5101 North Kings Highway and owned by Chef Curry Martin, is another must stop on the dining circuit. Martin says that when he decided to open his own restaurant he knew he wanted to offer something different from the usual dining experience in Myrtle Beach – something with a sophisticated, yet simple and absolutely fresh menu and a place where people could sit and relax in a warm and comfortable environment and enjoy each other’s company over a nice meal and a glass of wine. This is a place where music and conversation fill the air. Aspen Grille is the perfect place for a quiet night out for two or a lively group event. We enjoyed our dinner experience immensely. Martin is a 1996 graduate of the Johnson & Wales University Culinary School in Charleston, South Carolina. He began his culinary career at Noble’s Restaurant in North Carolina. There, he strived to uphold Noble’s mantra on absolute freshness, and keeping flavors of foods as natural as possible. In 1997, he moved to California to take a position at Domaine Chandon Winery in Napa Valley. While there, he also worked at Hudson House, the hospitality kitchen at Beringer Winery. “During my year stint in California, I came to appreciate the role of wine with food and the subtle changes we make as chefs that can really affect a wine’s characteristics, ” said Martin, who also travelled to France and began working at Restaurant Pierre Orsi in Lyon and then Restaurant Michel Rostang in Paris. Upon returning to the U.S., he worked at Sonoma Bistro in Charlotte and Prestige Wines. When he finally decided to open a restaurant of his own, Martin was determined to stand out from the typical dining options found in Myrtle Beach by serving dishes driven by freshness and balanced flavors, and by offering diners a sophisticated yet extremely comfortable setting and exceptional service. 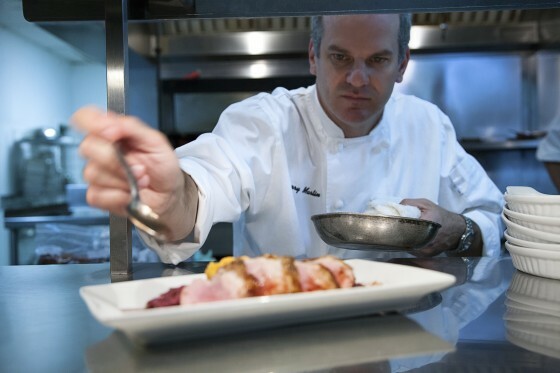 Dishes here are based on traditional Southern cuisine, with Chef Martin’s own personal twist. The menu changes seasonally and offers simple, but flavorful dishes with ingredients sourced from the best local suppliers. You can pair any dish with a wine from a hand-selected list to create an exceptional meal. Appetizer options include escargot, fried North Carolina oysters, local shrimp risotto, sautéed angus beef steak tips, seared yellow fin tuna, warm goat cheese crostinis, fried green tomatoes, cold water oysters or the superb pan seared jumbo lump crab cake, which was on special on the night we were there. You can select from the soup du jour or enjoy French onion and there are a variety of salads to choose from. The chef`s selections include the 10 ounce bone-in duroc pork chop, the Cedar Springs domestic lamb rack, local pan seared flounder and shrimp, market fresh fish, pan roasted Ashley Farms duck breast, pan roasted Springer Mountain Farm`s chicken breast, shrimp and grits, filet mignon, angus beef New York strip and ribeye, seared New Bedford sea scallops and the braised black angus short ribs. The latter three were our choices and they were each spectacular – the short ribs cutting like butter and the steak cooked to perfection. You can add a lobster tail to your meal or a variety of sides such as Brussel sprouts, rice, creamy cheddar grits, and fresh asparagus, and house cut fries, mushroom risotto, roasted potatoes. sautéed mushrooms, seasonal vegetables, spinach and Yukon mashed potatoes. Desserts include apple crumble, mixed berry bread pudding, chocolate chip brownie sundae, vanilla bean crème brûlée, peach crumble or flourless chocolate cake. We shared the latter two and they were amazing, particularly the former. Our server was the very charming Dee Shook. She shared with us the specials, one of which was a pan seared jumbo lump crab cake, and went over the menu selections in great detail. Call 843-449-9191 for reservations or email info@aspen-grille.com. GOLF: The Myrtle Beach area boasts more than 100 championship golf courses and 30 miniature golf courses, making it a premiere destination for golf enthusiasts and aficionados. There are approximately 3.4 million rounds of golf played annually in the Myrtle Beach area. Check out Hawaiian Rumble, where they host the Masters Tournament of mini golf every October. Yes there is such an event. It is owned by Bob Detwiler, who serves as the president of the Pro Mini Golf Association. They take their mini golf seriously. It is located on Highway 17 and very popular as was illustrated by the lineup when we arrived at 7:30 one evening. We appreciated the Hawaiian theme at each hole and the replica volcano, which erupted with fire every 30 minutes or so. There were quite a few Montrealers on the course that night including a large family from Montreal North right behind us. A SAFARI EXPERIENCE: As an animal lover, the moment I learned more about T.I.G.E.R.S. (The Institute of Greatly Endangered and Rare Species) I knew that I wanted this once in a lifetime opportunity to be part of our itinerary. We reserved our spots immediately and let me say this was indeed a major highlight from our trip. The man behind this operation is Doctor Bhagavan Antl, who started out training animals for movies and TV and they wanted a place where many went to essentially retire. They offer a guided safari like experience through a 50 acre preserve where many of the animals crawl right on top of your lap. A percentage of the revenue from the T.I.G.E.R.S. experience goes to the Rare Species Fund, which provides funding for on the ground international conservation programs. Where is this specifically located? I cannot put that information in print. Those who sign up are given a rendez-vous point of where to show up. You will have to experience it to learn more about this part of the journey. In order to maximize the peace for the animals and the privacy for guests, this preserve cannot be found on Google or MapQuest. Any address that you may find for this company is the one to Preservation Station in Barefoot Landing – 15 miles south of the actual location. The VIP Wild Encounter Tour does not have the capacity to accommodate wheel chairs or walkers. You must be able to walk/stand for 20 minutes and make your way up a flight of approximately 20 steps. Needing assistance of a cane and/or family member would be fine. You must be at the preserve no later than 9 a.m on your chosen day. No late arrivals are accepted, so give yourself plenty of time to get there. Any children (18 or under) on the tour must either be accompanied by a parent or guardian or arrive with a fully completed and signed release. The minimum age is six. No personal cameras, video cameras, or cell phones are allowed on the tour. Professional photographers shoot studio quality photographs and video. This gives you the opportunity to take home a set of portraits and phenomenal videos that are incomparable to any other photo opportunity. The $200 fee is well worth it. Tours run three to five days a week, from mid-March to early October, and cost about $300 per person. Close-toed shoes are required. That means no flip-flops or sandals. It is recommend that you do wear pants that come down to your knees. The animals will be crawling across your laps and they do have nails and although trimmed this can still be uncomfortable. No dresses or skirts are allowed on the tours. Avoid anything hanging off of you that an animal could get caught, which means no straps, purses or backpacks. Any item that may be needed due to a medical condition (i.e. insulin/small prepackaged snack for diabetes, medicine/epi-pen for severe allergies etc.) should be brought in and left behind the desk. White clothing is also frowned upon as it can interfere with flash photography and you will also be outside on the ground with animals. It is recommended making your reservation at least two weeks in advance. Tours are generally more popular during the summer months and holidays. No matter the size of the tour, it is an intimate experience. They adjust the time you spend with the animals accordingly, so every tour gets the same experience. It also operates rain or shine. A large majority of the tour is covered and they have the capacity to move portions of it inside if needed. They do have complimentary umbrellas available, but recommend that if it is raining that you bring your own rain jacket/poncho and wear clothing you do not mind getting a little damp in. This is a fully interactive activity. You will get to meet, pet, and hold a large variety of the animals. 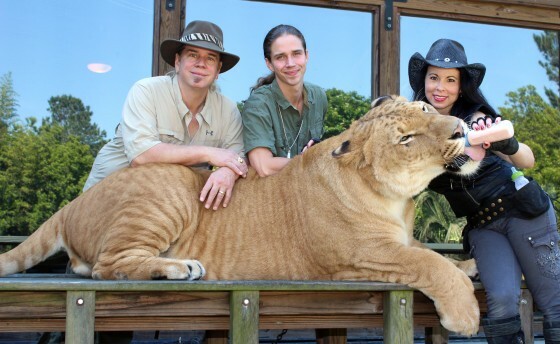 After filling out the necessary forms and getting a pep talk from long-time animal ambassador Rob Johnson, our group was introduced to a liger- a 900 pound hybrid between a male lion and a female tiger. We first watched it march around through a glass window and then got to look at in the flesh from about 12 feet away before they snapped our photo with the big cat in the background. Our group was then told to sit as tightly as possible on a horseshoe configuration of benches and then put our hands out. Soon after a binturon walked across our laps, allowing everyone to pet her. A binto what, you ask? This is a medium sized carnivore, also known as the Asian bearcat. Their fur is thick, coarse and black in colour and they have a long, bushy tail. 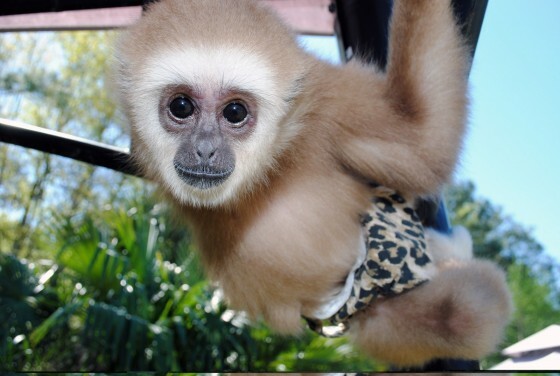 The animals on each tour vary depending upon the day and the time of year, but you will always get to spend time with the tiger babies, hang out with the monkeys or apes and meet exotic animals you’ve probably never even heard of before. All of the animal actors can be seen up close and uncaged in close personal contact with their trainers. The trusted relationship they have with their handlers can be seen and felt by the audience. This makes them perfect for live shows or personal appearance. Because Dr. Antle and his trainers have hand raised these animals, they are cooperative and safe and that saves valuable production time and money. People often think it is dangerous to get so close to wild animals like these, but the handlers at T.I.G.E.R.S. have been with these animals since they were babies and have developed a special friendship based on love and respect. In fact, Dr. Antle and his partner Kheira have actually delivered many of the cubs in the enclosure with the mothers because of their special relationships. T.I.G.E.R.S. has a proven method of training these animals: Never treat them as pets, lots of tender loving care, and thousands of hours of one-on-one handling. They even live with the animals 24 hours a day. As Rob Johnson told me, many of the staff like him live on the property and are literally married to their job. Antle’s son and daughter grew up here and are part of the team. The tour itself lasted about three hours. Early on we sat in a covered enclosure and they brought us baby tigers, lions, lynx and wolves to touch and hold. They were all so gentle. During a refreshment break in a tree top location we observed some members of the cat family let loose and running upwards of 45 miles per hour to try and catch a snack on a rope. Rob Johnson introduced us to a very intelligent eagle, which followed all of his commands. During these one of a kind shows, you see the animals interacting with their handlers who have developed a very special rapport with them. You will not see our animals sleeping or pacing in cages, as you may find in “traditional” zoos. Instead you will have a look at some of the most magnificent creatures on earth up close and uncaged doing all of the natural activities they would normally do in the wild. Why go to such great lengths? Because the team at T.I.G.E.R.S. feel that if people can get an up-close and educational view of these glorious beasts, they will be eager to learn of the plight of endangered species. During the Myrtle Beach Safari tour guests will have the opportunity to watch the trainers swim with the tigers. This is not something that they can allow the public to do so bathing suits are not required on the tour. There are some incredible personal/private encounters. A long standing favorite is to swim with Bubbles the elephant in the intra-coastal waterway on the edge of the preserve. You may want to spend more one on one time with the cubs, have an adventure through the forest or paint with the great apes. These encounters start at $5,000. Email tigersmbsafari@yahoo.com for more information on that. We all got to meet, pet and feed the gigantic and gentle Bubbles. T.I.G.E.R.S. works closely with international wildlife conservation projects in Africa and Thailand. In addition to providing much needed funds for these programs, personnel have been involved in field research as well. Through our appearances on the Discovery Channel, Animal Planet and NBC’s Tonight Show they have been able to reach hundreds of millions of people with an educational message of the importance of wild animal conservation. The animal actors have appeared in over 500 films, television shows, commercials and advertisements worldwide. You have seen some of these animals in great films such as Ace Ventura, Forrest Gump, Dr. Dolittle, Mighty Joe Young and many others. For more information, log on to http://www.myrtlebeachsafari.comand http://www.tigerfriends.com/RSF.html). 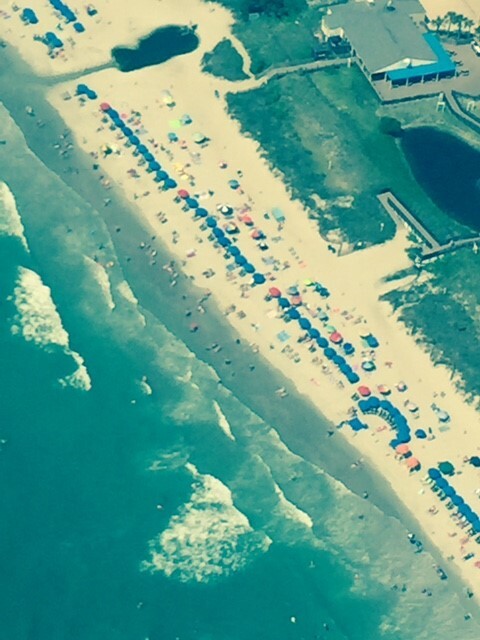 HELICOPTER RIDES: There is nothing like a helicopter ride to truly see all of what Myrtle Beach has to offer. Ocean Front Helicopters (http://oceanfront-helicopters.com) provides some of the best deals and we can personally vouch for an amazing experience. Formerly known as Huffman Helicopters, every one of their tours take you along the coast for gorgeous views of beautiful, sunny beaches. They have over 40 years of experience in the aviation industry, having maintained a perfect safety record from day one. Our pilot Nick told us that on some days they take as many as 400 trips. There may be other helicopter companies in town, but Oceanfront offers the only $20 flight that will actually take you over the beach! “Why pay twenty bucks to look at the tops of buildings when you could be treating yourself to stunning views of beautiful coastline?” they ask. There are southbound tours that fly over estuaries and marsh land for nature lovers. There’s a tour that flies north for fantastic views of the Skywheel and Boardwalk and there is even one that flies along the “Golden Mile,” a stretch of coastline where million dollar mansions are nestled into the dunes. Whether you’re just looking to add some variety to your annual family vacation or a first-timer looking for something fun and unique, there’s no better way to make this a memorable vacation than to see the beach from a birds-eye view in any one of our amazing helicopter tours! Maintenance personnel are factory trained, and the ground crew are handpicked for their skills, professionalism, and personality. The Inlet Tour is the one we opted for. The views are simply breathtaking, such as low country marshes, untouched sand dunes and a bevy of native wild life. Several bird species, alligators and turtles all call the marshlands home. The length of this tour -15 to 20 minutes- also greatly increases the chance of spotting a pod of dolphins playing in the water or even a lone shark hunting for its next meal! The untouched sand dunes take you back to the natural beauty of a coastal treasure from yesteryear. This tour is capped off with an awe-inspiring view of the mouth of the inlet. The sheer magnitude of this feature where the ocean meets land can’t truly be appreciated until you see it from a bird’s eye view. The cost is $129 per person. Bring your camera on this tour and snap some photos that will make all of your family and friends green with envy! Personnel will take a nice shot of your party in front of the helicopter when you land and print four by six for you. The location is right by the airport, with plenty of free parking. This is a well-oiled machine. No reservations are required. Just line up for your tickets and you will be told which line number to queue at. When it is your group’s turn personnel will load you on to the chopper, fasten the seatbelts and hand you headsets so you can communicate with the pilot. We appreciated Nick’s descriptions of what was below. He even recommended specific restaurants. Always tip your pilot as that accounts for an important part of their livelihood. The company can accommodate handicapped passengers. Wheelchairs, walkers, crutches and any other device that assists with motor functions will be brought right up to the helicopter. The loading staff will place the individual inside of the helicopter and their device will be set off to the side of the landing pad area. Once the flight is over, staff will bring the devices back onto the helipad and assist the individual out of the helicopter. As for the intellectually handicapped, as long as they are able to receive instruction and can follow safety guidelines, they can enjoy the tours as much as anyone else! “We take great pride in making sure special needs individuals are properly taken care of and that they have an amazing time with us!” says Printz. The $20 tour is considered an “Intro Flight.” It is the least expensive tour offered and is intended for those who may be on the fence about flying. The short ride will get them up in the helicopter and accustomed to what it feels like, but it is also short enough that if they don’t like it they will be back down on the ground quickly. “Soon after we created this tour, many of our customers who can’t afford the longer flights would purchase it just to be able to say they have flown in a helicopter!” said Printz. They operate seven days a week, 365 days a year. During the non-summer months the company maintains a smaller staff, but as long as weather permits they do fly. For more information call (843) 946-0022. ATTRACTIONS: The beach is certainly the Myrtle Beach area’s top attraction, but the fun does not end with surf and sand. The Grand Strand offers a wide range of unique attractions and exciting entertainment options from shopping, dining, water sports and theme parks, to live entertainment theaters, nightclubs and celebrity concerts. The Myrtle Beach area boasts more than eight live theatres with a total of over 11,577 seats. ALABAMA THEATRE: For my family, no holiday is complete without a live show and that is exactly what we got at the Alabama Theatre (www.alabama-theatre.com). There is good reason why this is recognized as the number one entertainment venue in the area. Located at 4750 Highway 17 South next to popular Barefoot Landing, the theatre opened in 1993 and got its name directly from the country music super group Alabama whose members decided to build this state-of-the-art facility. Gaylord Entertainment was eventually brought on board to collaborate in writing, directing and producing a nightly show incorporating many musical genres. Gaylord Entertainment, then owner of the Grand Ole Opry, Opryland USA Theme Park, Opryland Hotels, TNN & CMT, was no stranger to big time show business and brought a talented team from Nashville, Las Vegas and Los Angeles to write, choreograph, costume and produce the first season’s shows called American Pride and Christmas in Dixie. Turn the page to 2015 and the Alabama Theatre remains at the forefront of entertainment venues on the East Coast with Gaylord Entertainment continuing to produce their signature ONE The Show and the South’s Grandest Christmas Show. 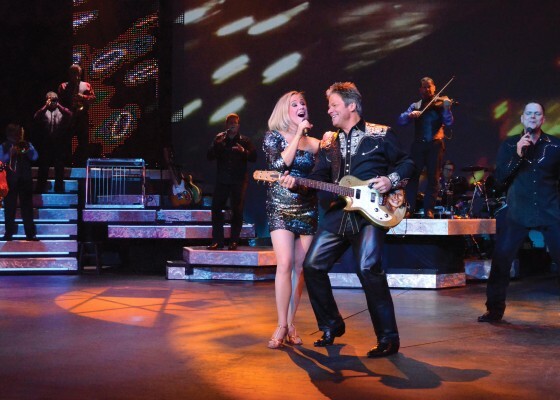 The Guest Artist Concert Series also brings in top touring acts once a week like Alabama, Vince Gill, Josh Turner, Engelbert Humperdinck, Temptations & Four Tops, Loretta Lynn and many more. Planning for each year’s shows begins many months prior to the grand opening before a live audience. Creative direction is set first with the goal of making the new year’s show fresh and exciting for returning patrons by introducing new songs, scenic elements, costumes and performers. Next, writers, choreographers, music directors and technical experts develop the new show and prepare for rehearsals and scenic implementation. Extensive rehearsals follow involving the singers, dancers and band learning the new show under the direction of the production team. Even the technical crew is integral to the rehearsal process since they must perfect the flow of the show backstage. The Alabama Theatre shows remain on the cutting edge of entertainment technology by adding new scenic, video and sound elements to the 2015 shows. We saw ONE The Show and it was nothing less than spectacular. What a quality evening of entertainment! The presentation from a talented group of singers, dancers and musicians features everything from country, gospel, broadway, pop and rock to plenty of hilarious family comedy. We heard songs from Michael Jackson, Frozen, Mary Poppins, the Rat Pack (Dean Martin, Frank Sinatra and Sammy Davis Jr.), Les Miserables and classics like Putting on the Ritz and Amazing Grace. The talented entertainers, extravagant costumes and extraordinary scenery will make you feel like you are in New York or Las Vegas – at a fraction of the price! Emcee and featured vocalist Greg Rowles is quite personable and changes his suit every five minutes or so. Remember the name Ricky Mokel. This is the alter ego of stand-up comic Grant Turner. He introduces himself to the audience before the actual show begins as a stage hand and reads out a series of instructions. With a thick Southern accent, he has the crowd roaring with laughter in seconds. Throughout the evening he comes back to perform small bits and at intermission and the end of the night signs autographs in the lobby. He does perform solo occasionally. Ventriloquist Todd Oliver and his talking dog Irving, America’s Got Talent semi-finalists, are also part of this year’s lineup. ONE runs from February through October six nights a week. Kids are admitted free between Memorial Day and Labour Day (two kids aged 16 and under per paid adult). A special Christmas show runs in November and December. One day each week the theatre generally presents a guest artist. If you want an evening filled with song, dance and laughter, the Alabama Theatre is the place you want to visit while on vacation with your family and friends! The memory will last a lifetime. Purchase your tickets today by calling 1-800-342-2262 or online. Handicapped parking space in their large lot are available for vehicles bearing handicapped parking stickers or license plates. These spaces are located on the south side of the theatre. Wheelchairs may be reserved in advance to assist in transporting guests from their vehicle to their seats. Parking lot assistance may also be arranged for people with disabilities. Just let reservations know when ordering your seats. Accessible restrooms are available in the main lobby. An amplified hearing device and wheelchair and sight-impaired seating are available. Sign language-interpreted performances may be arranged for patrons who are deaf or hard of hearing. 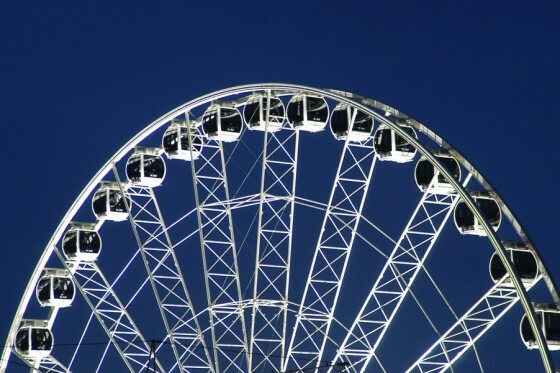 SKYWHEEL: Check out the SkyWheel for what promises to be a very enjoyable eight to 10 minute flight. The recurrent hours of operation are Sunday to Saturday from 11 a.m. until 11 p.m., barring of course inclement weather or lightning. Email info@skywheel.com for more information. Anywhere from two to six people can fly at one time. For the VIP flight, up to four can fly. And don’t worry – if there are just a few of you, no strangers will be put in with you. Each flight is your own private experience! If you’d like the easiest access to the SkyWheel, there is a paid parking lot right next door. For a quick visit, have a handful of change and use some metered spots all along Ocean Boulevard. Situated as a centerpiece of the 1.2 mile-long Oceanfront Boardwalk and Promenade, the SkyWheel is surrounded by some tasty eats, great shopping and the pristine sands of the Atlantic. When you’re done having your breath taken away by the view from your flight, browse the LandShark SurfShack and then do some browsing at all of the shops. RETAIL: The Grand Strand shopping complexes are destinations within themselves, including more than 300 outlet stores. Visitors can stroll along boardwalk promenades on warm evenings, venture in and out of hundreds of unique specialty stores, and dine in exceptional restaurants along the way. We checked out the Tanger Outlets and were impressed with the deals available at the major brand name stops. Ditto for Broadway at the Beach, a gigantic and fun complex of food and fun. FAMILY REUNIONS: The Myrtle Beach area is an ideal location for multi-generational travel or family reunions. For visitors both tall and small, the Grand Strand offers attractions certain to please every age group. Beachfront hotels, timeshares and cottages offer spacious options that will accommodate families of all sizes. 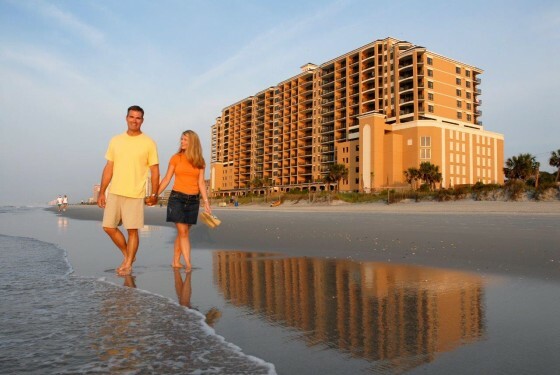 ROMANCE: With dazzling sunsets painting the horizon, and palmetto trees swaying in the gentle breezes, the Myrtle Beach area offers a picturesque location for a romantic getaway or beach wedding. The picturesque beach setting also makes the Grand Strand an ideal spot for newlyweds to spend a romantic and fun honeymoon. AMUSEMENT PARK: Located at 300 Ocean Boulevard in the heart of Myrtle Beach, Family Kingdom (http://www.familykingdomfun.com/?rf=family-kingdom) has been a tradition here for locals and visitors for more than 40 years. Opened originally as Grand Strand Amusement Park in 1966, it was rechristened “Family Kingdom Amusement Park” after being purchased in 1992 by the Ammons family, owners of the landmark Sea Mist Oceanfront Resort. It has 39 rides. Family Kingdom is the home of the legendary Swamp Fox wooden roller coaster, the Giant Wheel, and over 37 other great rides and attractions for all ages. Here you get the full amusement park experience with midway games, family entertainment and traditional park temptations such as funnel cakes, cotton candy and corn dogs. Family Kingdom is also home to “Splashes,” a beachfront water park located across Ocean Boulevard from the amusement park. Splashes features exhilarating water slides with breathtaking drops of as much as 100 feet; open and enclosed wet and wild flume rides; and a spacious 425’ long lazy river with waterfalls. There are also splash pools, eight kiddie slides and two rain trees. This is another place we did not have time to visit. More information about Family Kingdom Amusement Park and Splashes is available atwww.FamilyKingdomFun.com. In 2013 the park added four exciting new rides including the Twist ‘n Shout steel roller coaster. And in 2014, they introduced the interactive bouncing on the Jump Around Dune Buggies, and the Magic Bikes. Longstanding favorites include the Swamp Fox wooden roller coaster, the Log Flume, bumper cars and go-karts. The Picnic Pavilion is a covered dining area that can accommodate up to 100 guests for birthday parties, family reunions or any group outing. SHAWN’S BACKWATER TOUR: When in Myrtle Beach we strongly recommend you experience some jet skiing, more specifically via Shawn’s Backwater Adventure (http://shawnsbackwateradventure.com) andhttp://myrtlebeachwatersports.com/wp. This was on our original itinerary, but had to be scratched due to some scheduling conflicts. I did a lot of research before choosing this company and wanted to give them some well-deserved exposure, Shawn Zimmerman and Steve Wiegel are the men in charge here and they know what they are doing. Their company, Myrtle Beach Water Sports, opened its first location in 1996 with three jet skis. Today they have over 50 jet skis, 10 pontoon boats, two 75 foot dolphin cruise boats, a pirate cruise boat and more. “We are proud to say that we offer a little something for everyone with locations and activities from one end of the Grand Strand to the other,” says Shawn. He and Steve are always on hand to greet their returning guests that come year after year. Their parents and kids are active in the day to day operations of the business as well. The waters of South Carolina have been Shawn’s playground for the past 16 years. He has explored and rode South and North Carolina’s backwaters since he moved to Myrtle Beach in 1995. At Shawn’s Backwater Adventure, you’re not just renting a jet ski, you are taking a tour of the Waccamaw River’s beautiful winding trails! Shawn and Steve are originally from Mt. Pleasant, Pennsylvania. Shawn moved to Myrtle Beach in 1995. Growing up, he worked as a bartender at night and a Jet Ski rental guide during the day. This is where he found his love for the water and the thrills a jet ski can bring. After working for a rental company for the summer, the duo I turned their passions into a reality by purchasing four rental skis and officially opening Myrtle Beach Watersports in 1997. They have been showing locals and tourists alike a great time on the open water, now I’m taking it to the back country where you can ride on glassy smooth water through the moss covered oaks. It’s a beautiful sight that you’ll have to see to believe! We were told that the one hour intra-coastal tour is a thrilling ride down the Atlantic Intracoastal Waterway to the scenic backwaters of the historic Waccamaw River. These beautiful waters are lined with oak trees draped with Spanish moss. Experienced guides lead you on an extraordinary ride, twisting and turning through narrow fingers that branch off the waterway and river you will get to see giant Osprey and their nests, turtles and even hear lions roar as you pass by the zoo. Rider safety is of utmost importance for any level, but they put a little extra emphasis on this when it comes to their entry level series to ensure the safety of you and your family. Best of all, the central location makes this very day trip friendly. The cost for one hour is $89 and $99 to double up. You must be 16 years of age or older to operate a personal watercraft and18 years of age to operate with a passenger. Children passengers ages five to 12 ride free. Nobody under five is allowed. Guests must arrive 30 minutes prior to departure time. All members of the party will need to bring a valid form of ID. A credit card is required to hold the reservation along with a 50 percent deposit. There is a 48 hour cancellation policy and any cancellations within that time, or arriving late for check-in will result in a charge for the full amount of your reservation total. 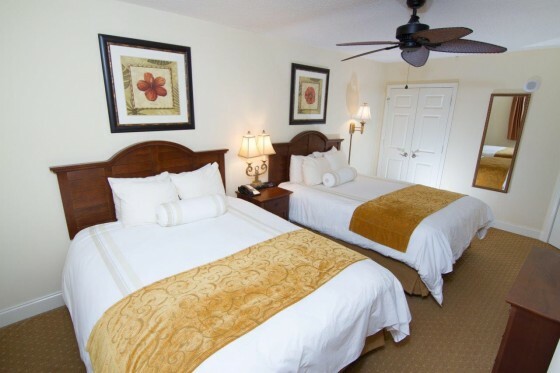 In case of bad weather and your stay is over, refunds or rescheduling will be made. . For reservations call 843-685-1006. NEXT TIME AROUND: So what have I placed on my list for “next time?” Shopping at the Market Common and Coastal Mall. Evenings of entertainment at the Caroline Opry, Legends in Concert, the Palace Theatre, Medieval Times Dinner Theatre and the House of Blues. Stops at Brookgreen Gardens, Ripley’s Aquarium, Hollywood Wax Museum, Wonder Works Indoor Amusement Park, MB Zipline Adventures, Waves water park and perhaps even some minor league professional baseball with the Chicago Cubs affiliate the Myrtle Beach Pelicans. Check all of these places out on the web. JEWISH COMMUNITY: South Carolina’s Jewish population is just under 14,000 people. Myrtle Beach has enjoyed exponential growth in year-round population, tourism, business opportunities, and employment in the past decade, and so did the Jewish community and the kosher amenities. The Chabad Shul, called Heichal Avraham welcomes all guests for daily Shachrit, mincha/maariv and Shabbat. They are located at 2803 North Oak Street and can be reached at 843-448-0035. There an orthodox synagogue, Beth El, at 404 Calhoun Drive; a Conservative congregation, Temple Emanu-El at 406 65th Avenue North; and a reform, Temple Shalom at 4023 Belle Terre Boulevard. Temple Emanu-El was founded in 1963. Across the state there are many other synagogues. In terms of kosher food, the Jerusalem Restaurant is located at 205 North Kings Highway. The Bi-Lo Supermarket at 1241 38th Avenue is open 25 hours a day and has frozen, refrigerated and dry kosher sections. Info 🙁 843) 626-7400 or (843) 626-7400. For details email info@koshermyrtlebeach.com. As reported on a local website, a decade ago, 26 people met in a Carolina Forest home without a rabbi and without a Torah scroll. On June 7, 2015 what has become Temple Shalom, a congregation of 65 families led by Rabbi David Weissman, and now in its own building with not one, but rather two Torah scrolls, celebrated its 10th anniversary. Temple Shalom, Horry County’s only reform Jewish congregation, now holds Sabbath service. on Friday nights at 7:30 p.m. and Saturday mornings at 10:30 a.m.
A 10th anniversary gala celebration took place at a local hotel. Temple president Lily Ann Revitch said every time she walks through the door of the new building, where the first service was held May 8, she feels wonderful. It was in her home that the congregation began, just two months after her and her husband Ze’ev moved to the area from Alexandria, Va. in November 2004. She woke her husband up at 2 a.m. and told him God told her to start a congregation. He had promised his wife—originally from England—that when they moved to Myrtle Beach, they’d go wherever necessary to find a congregation to her liking. PreviousThe Rabbi who advises Google, Rabbi Issamar Ginzberg Live in Montreal!